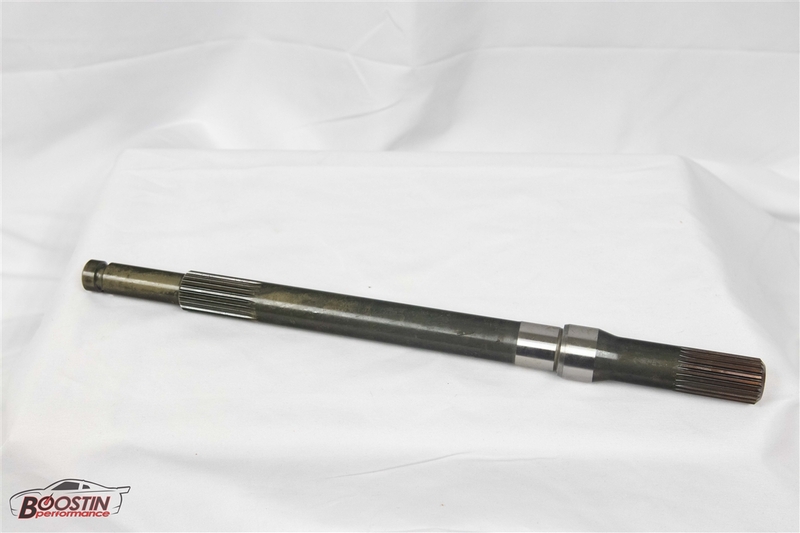 For all the DSM / Evo 1-3 guys out there tired of breaking/twisting their stock output shaft to the transfer case...... we have the perfect solution for you......A BOOSTIN PERFORMANCE 300M TRANSMISSION OUTPUT SHAFT! Our BP 300M Transmission Output Shaft features some key design changes and special treatment to help withstand the incredible forces imposed on this part. This is the perfect solution for every high horsepower 4G63 destroying their trans output shaft. We have tested this output shaft on our 1200+ WHP shop drag car, the Red Demon, which has broken the stock output shaft on a regular basis. 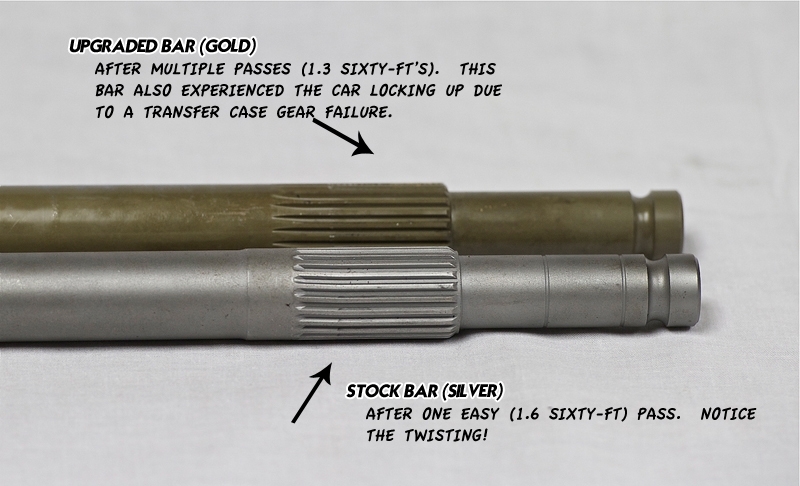 In the second image, notice how the splines on the BP 300M Transmission Output Shaft have held up compared to the twisted splines on a stock OEM shaft. (The OEM stock bar is silver; our upgraded bar is gold). The stock bar pictured has (1) easy 1.6 sixty-foot pass on it. As you can see, the splines have already experienced major twisting. Our custom 300M Trans Output Shaft has multiple passes on it - all of them were 1.3 sixty-foot run, and without a single issue (no twisting/shaft breaking). This custom 300M Trans Output Shaft also experienced the car locking up due to a transfer case gear failure. This would have broken the stock output shafts in the past, yet with our custom BP 300M Transmission Output Shaft, that's a thing of the past!! No more broken or twisted shafts. This product is for manual transmissions only, and will fit 23-spline transfer cases. **Please note that the shipping rate includes packing material, shipping, and insurance via UPS. A signature is REQUIRED for delivery. Shipments will NOT be released without a signature. This product is for manual transmissions only.